I’ve been very under the weather this week so very little excitement has been happening besides a lot of Olympic watching. However for C water play seems to be the coolest thing around here in the past week. I tried out a new water idea that a friend that I had seen in the past. He has always been a guy who loves the water, but he thinks this is the best. He could play and play with his “water table” for a long time! I love this activity because it is so SIMPLE and I didn’t need to get any supplies. I can use whatever I have around the house and it keeps him busy for a very long time! BEFORE I TRIED THIS I WAS CERTAIN MY BABY HAD GOOD HEAD CONTROL and UPPER BODY CONTROL AND I WAS SUPERVISING AT ALL TIMES. 1. I laid out a few towels on your floor – whatever surface you prefer. I did it in the living room, although it’s probably easier on a floor where water can be mopped it. He never splashed enough water on the floor that the towels haven’t been able to contain. If it is nice out being outside would be perfect for this activity. 2. I filled up the baking sheet with appropriate temperature water and set it on the floor. I put very little water on the baking sheet. Just enough to get the idea. I like to add things that I do not have to worry about choking on as he puts everything in his mouth. Favorites include: Measuring Spoons, Measuring Cups, Plastic toys that are appropriate for water, and bath toys. 4. I let my baby play! I am always around keeping my eye on C as water is involved. You never want to leave a baby unattended with water play. He usually ends up pretty wet when he is done playing so we usually let him play sans shirt. He mainly just wears his diaper actually when he plays! We are definitely having a wild time around here! I love this activity because it is a great way to play belly down. Tummy time is so important for our babies! Click on each photo to see product details. Affiliate links. Baby water play is just one way to play on your tummy! Get all your tummy time needs in one handy guide. 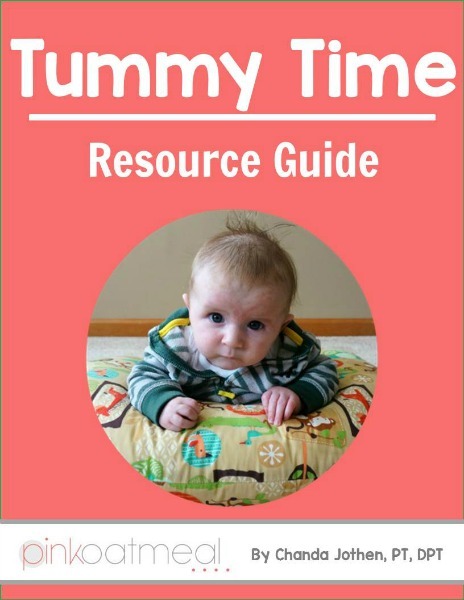 This is a great reference to help take the struggle out of tummy time and the constant late night Google searches! I get it I’m a mom of three too and life with a new baby is not easy! I’m hoping to take one less thing off your plate for you in this guide! Get out the exercise ball and play! Ball pits can be a ton of fun. Here are some ideas to make your own. There are plenty of everyday objects around the home that are perfect for baby to play with! Take out some bubbles and play with baby! Cardboard boxes can be made into awesome toys! Lay out some pillows and let your baby do the gross motor crawl! Need an option for contained play for a short period of time. A diaper box may do the trick instead of any baby equipment! My store at Pink Oatmeal is full of ideas to get the kids moving at home, in the classroom, and in therapy! If you prefer Teachers Pay Teachers you can find me there too! 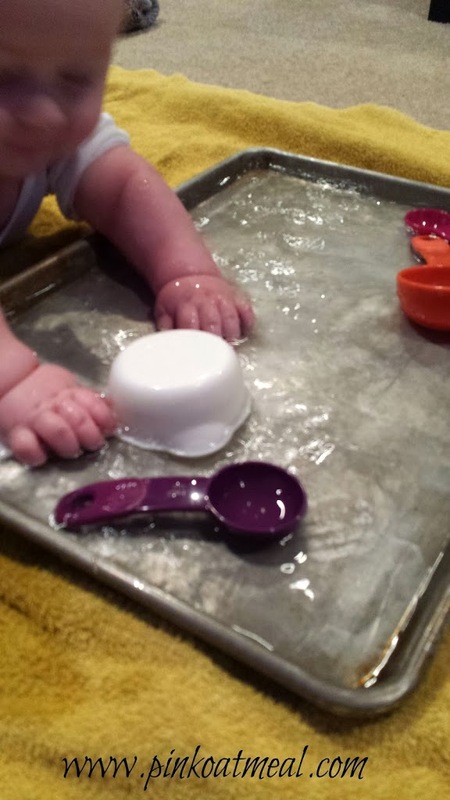 wonderful tummy time and sensory play activity. Remember: NEVERY LEAVE YOUR BABY UNATTENDED with this activity. He or she can drown in as little as one inch of water. Yep totally agree! That’s why I tried to bold it in the post! It’s a great activity when you are safe! 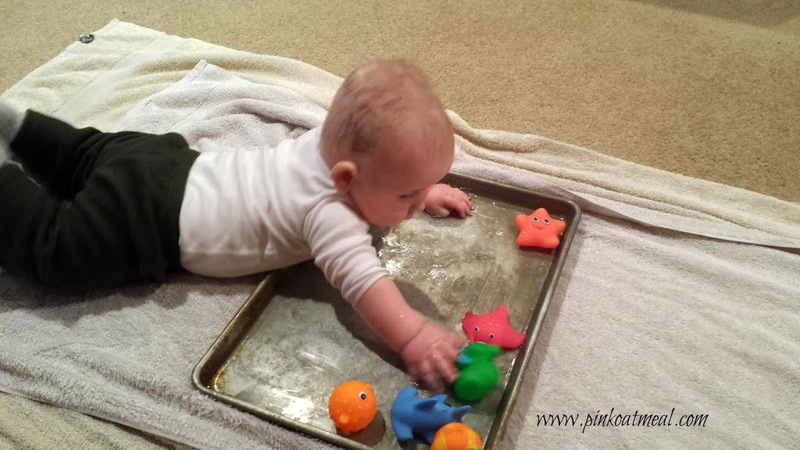 I just tried this water pan activity with my 9 month old and it was so fun! He loved to splash with one hand while pushing up on his tummy. I got down on the floor on my tummy so I was facing him from across the pan…he laughed every time he splashed, which made me laugh, and then that made him laugh even harder! I had to add extra towels to the sides of the pan with all that splashing! The only thing was that he really wanted to drink the water in the pan — he kept sticking out his tongue and putting his mouth down in the water to try and lap it up like a dog. That’s why close adult supervision is so important with this activity! I’ll probably try this one several more times in the future so he can consistently start to understand that the water is for splashing and not for drinking! Haha. Thanks for sharing this idea, as well as the disclaimer for close adult supervision. I had to laugh at that! I hadn’t had trouble with my son drinking the water although sometimes he tries to eat his food from his tray of his high chair that way! Yes definitely an adult supervision activity! Love this! Love your blog! Just found you tonight! So much great stuff!! Thanks for stopping by! Hope you find more stuff you love! I have also just put a 1/2 inch or so of water on the high chair tray with several items to,move around even ice cubes. Colored ice cubes are fun to. As already stated this activity needs supervision. Also it is help to plan that activity for the day your mopping the floor lol! ENJOY! Such a simple and entertaining activity to keep little ones busy. My 2 were water babies and loved anything they could splash, pour or get their little hands into. I used to love their surprised expression when they splashed water onto their face. So cute. I hope you both enjoyed it! What is the earliest age for my baby to try this? It’s hard to put an age on this as head control and strength can vary baby to baby. I wouldn’t recommend this activity if baby doesn’t have excellent head control and of course full supervision at all times. My almost four month old does okay with tummy time but eventually she gets frustrated and starts pushing her hips up using her feet almost like downward dog! What does this mean? It may be her way of exploring and learning about her body, but without actually seeing it I can’t say for sure. I know my 8 month old has been doing that same move for a while and still does it now. I’ve always thought of it as his way of learning about his body and how to move it! 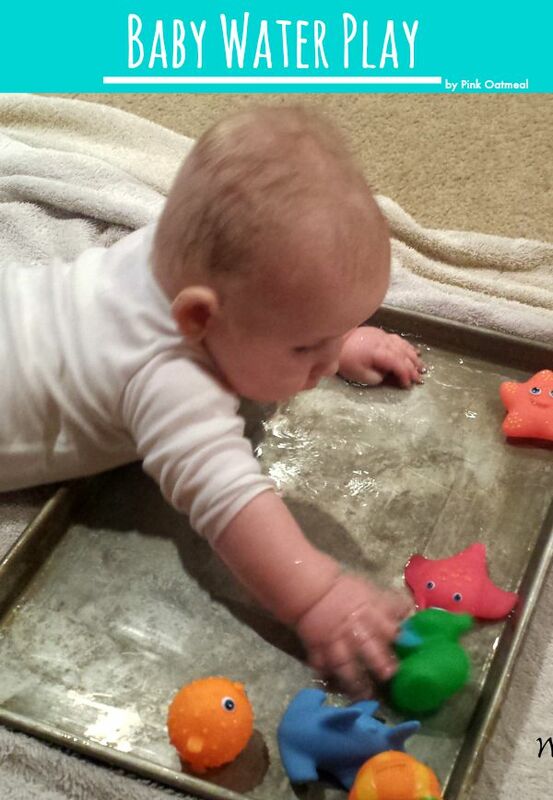 What perfectly simple little sensory activity, and great for tummy time! I would like to feature your activity in a list we have on ADAM & Mila with tummy time activities and milestones. I just want to check with you first since I would be grabbing a picture from your page with the link. I won’t copy the content, just link to you with a picture, please drop me a line to let me know if it is ok to use your picture? Thanks for checking, that would be fine!